The incidence of mycobacterial infections has undergone a varied course over the past 50 years. For an approximate 30-year period following 1950, the incidence in mycobacterial infection declined annually in excess of 5%. This was followed by a paradoxical sharp increase at the rate of approximately 20% during the late 1980s and early 1990s, due to multiple factors such as acquired immunodeficiency syndrome (AIDS), drug resistance, and population influx from endemic areas. With improved awareness, prevention, and drug therapy, the incidence has continued to decline from the late 1990s into the current 2000s. Definition. Mycobacteria are nonmotile, non-spore-forming aerobic bacilli that resist decolorization by acids, thus the term "acid-fast" bacilli. 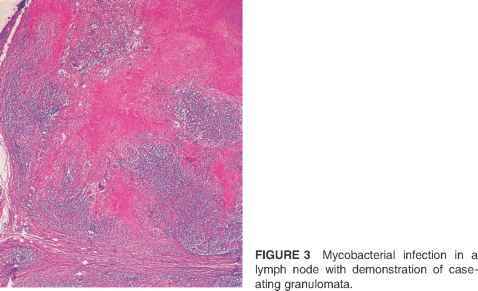 The classically described mycobacterial infections were caused by Mycobacterium tuberculosis. Infections affecting the head and neck may be the result of M. tuberculosis or nontuberculous (atypical) mycobacteria. Epidemiology. During the mid to late 1980s, the incidence of cervical mycobacterial disease was noted to rise, largely due to the increase in Asian and Hispanic immigrant populations into the American cities as well as the increase in patients infected with human immunodeficiency virus (HIV) manifesting immunodeficiency (AIDS). With heightened awareness, prevention, and improved public hygiene, the incidence into the current century has continued to decline since the mid 1990s. Currently, those at risk for mycobacterial disease include third-world immigrants and patients with immunodeficiency disorders but may also include the young, particularly with respect to atypical mycobacterial infection. Clinical Manifestations. The head and neck manifestations of mycobacterial disease are broad in spectrum. In addition to the cervical lymph nodes, affected head and neck regions include the middle ear, nasal cavity and paranasal sinuses, oral cavity, pharynx, larynx, and salivary tissue. The cervical lymph nodes represent the most common extrapulmonary site of involvement by mycobacterial infection (1). It is important to differentiate between tuberculous and atypical disease-induced cervical adenitis, as the clinical scenario and management are different. Cervical adenitis caused by tuberculosis is noted to involve the supraclavicular and posterior nodal groups. The majority (greater than 80%) of patients with cervical tuberculosis do not have pulmonary disease and few patients present with the typical constitutional sequelae of fever, night sweats, hemoptysis, and weight loss. Diagnosis. 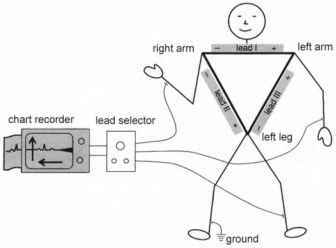 Patients at risk for or suspected of having M. tuberculosis infection should have a chest X ray and a PPD skin test. Chest radiographs have a low yield of positive findings (less than 20%), whereas a positive PPD may be noted in up to 96% of those infected, provided the patient is not immunocompromised (2). In the event that a patient with HIV demonstrates immunocompromise, a skin reaction of 5 mm (as opposed to 10 mm) on PPD testing is deemed to be positive; this occurs in up to 40% of patients with HIV (3). In order to secure a definitive diagnosis, fine needle aspiration of a suspected lymph node may be performed. Although the initial smear may be positive for acid-fast bacilli in only 20% of patients, the presence of granulomatous inflammatory changes raises the suspicion of tuberculosis. A definitive culture may be obtained after six to eight weeks' incubation. Atypical mycobacterial disease is suspected in patients unresponsive to medical therapy with a documented smear demonstrating acid-fast bacilli. In the absence of proven acid-fast positivity, material from curettage from a necrotic skin lesion may be used for further histologic examination and culture (Fig. 3). Treatment. Cervical tuberculosis is a medically treated disease. Treatment is aimed at both systemic and local manifestations of the disorder. With a confirmed diagnosis, multiple-drug antimicrobial therapy is initiated. A four-drug regimen consisting of rifampin, ethambutol, isoniazid, and pyrazinamide is recommended, with the addition of streptomycin as an alternative. This schedule is continued for six months, sometimes with the deletion of ethambutol and/or pyrazinamide after two months. Pregnancy precludes the use of drug therapy until after delivery. Surgical nodal excision may be carried out to secure the diagnosis in the event a node remains enlarged following antimicrobial therapy or in the second or third trimester of pregnancy. 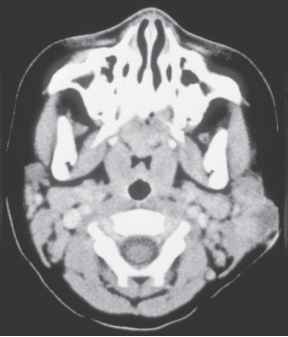 FIGURE 1 Atypical mycobacterial infection involving submental lymph node in a child. Source: Photo courtesy of Dr. Edward Wood. FIGURE 2 Axial computed tomography image demonstrating necrotic lymph node in a patient with atypical mycobacterial infection. Source: Photo courtesy of Dr. Edward Wood. simiae, Mycobacterium chelonei, and Mycobacterium fortuitum. It is due to this resistance that atypical cervical infections are primarily treated with nodal excision, prior to capsular rupture, if possible (4). In the presence of skin necrosis and soft-tissue breakdown, curettage or excision of necrotic tissue is advocated. Complications and Prognosis. Complications related to cervical mycobacterial infections are few. Uncommonly, soft-tissue breakdown may occur to the extent that wide debridement is required, resulting in significant fibrosis and scarring. In the immuno-competent patient, response to therapy is generally favorable, with a low incidence of recrudescence. Immunocompromised patients may respond slowly or not at all to therapy and are at risk for recurrence. Mycobacterial infections are discussed in more detail in Chapter 12.